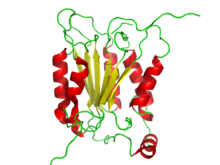 Caspases (cysteine-aspartic proteases, cysteine aspartases or cysteine-dependent aspartate-directed proteases) are a family of protease enzymes playing essential roles in programmed cell death (including apoptosis, pyroptosis and necroptosis) and inflammation. They are named caspases due to their specific cysteine protease activity – a cysteine in its active site nucleophilically attacks and cleaves a target protein only after an aspartic acid residue. As of 2009, there are 11 or 12 confirmed caspases in humans[note 1] and 10 in mice, carrying out a variety of cellular functions. Structure of caspase-1 (CASP1), originally called interleukin-1 beta-converting enzyme (ICE), the first human caspase to be identified. The role of these enzymes in programmed cell death was first identified in 1993, with their functions in apoptosis well characterised. This is a form of programmed cell death, occurring widely during development, and throughout life to maintain cell homeostasis. Activation of caspases ensures that the cellular components are degraded in a controlled manner, carrying out cell death with minimal effect on surrounding tissues. Caspases have other identified roles in programmed cell death such as pyroptosis and necroptosis. These forms of cell death are important for protecting an organism from stress signals and pathogenic attack. Caspases also have a role in inflammation, whereby it directly processes pro-inflammatory cytokines such as pro-IL1β. These are signalling molecules that allow recruitment of immune cells to an infected cell or tissue. There are other identified roles of caspases such as cell proliferation, tumour suppression, cell differentiation, neural development and axon guidance and ageing. Caspase deficiency has been identified as a cause of tumour development. Tumour growth can occur by a combination of factors, including a mutation in a cell cycle gene which removes the restraints on cell growth, combined with mutations in apoptopic proteins such as Caspases that would respond by inducing cell death in abnormally growing cells. Conversely, over-activation of some caspases such as caspase-3 can lead to excessive programmed cell death. This is seen in several neurodegenerative diseases where neural cells are lost, such as Alzheimer's disease. Caspases involved with processing inflammatory signals are also implicated in disease. Insufficient activation of these caspases can increase an organism's susceptibility to infection, as an appropriate immune response may not be activated. The integral role caspases play in cell death and disease has led to research on using caspases as a drug target. For example, inflammatory caspase-1 has been implicated in causing autoimmune diseases; drugs blocking the activation of Caspase-1 have been used to improve the health of patients. Additionally, scientists have used caspases as cancer therapy to kill unwanted cells in tumours. Most caspases play a role in programmed cell death. These are summarized in the table below. The enzymes are sub classified into three types: Initiator, Executioner and Inflammatory. The activation of initiator caspases and inflammatory caspases is initiated by dimerisation, which is facilitated by binding to adaptor proteins via protein–protein interaction motifs that are collectively referred to as death folds. The death folds are located in a structural domain of the caspases known as the pro-domain, which is larger in those caspases that contain death folds than in those that do not. The pro-domain of the intrinsic initiator caspases and the inflammatory caspases contains a single death fold known as caspase recruitment domain (CARD), while the pro-domain of the extrinsic initiator caspases contains two death folds known as death effector domains (DED). 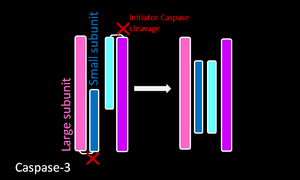 Once appropriately dimerised, the Caspases cleave at inter domain linker regions, forming a large and small subunit. This cleavage allows the active-site loops to take up a conformation favourable for enzymatic activity. Executioner caspase constitutively exist as homodimers. The red cuts represent regions where initiator caspases cleave the executioner caspases. 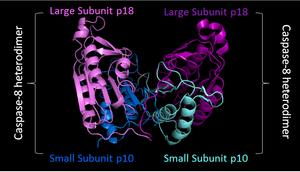 The resulting small and large subunit of each Caspase-3 will associate, resulting in a heterotetramer. Initiator caspases are activated by intrinsic and extrinsic apoptopic pathways. This leads to the activation of other caspases including executioner caspases that carry out apoptosis by cleaving cellular components. Apoptosis is a form of programmed cell death where the cell undergoes morphological changes, to minimize its effect on surrounding cells to avoid inducing an immune response. The cell shrinks and condenses - the cytoskeleton will collapse, the nuclear envelope disassembles and the DNA fragments up. This results in the cell forming self-enclosed bodies called 'blebs', to avoid release of cellular components into the extracellular medium. Additionally, the cell membrane phospholipid content is altered, which makes the dying cell more susceptible to phagocytic attack and removal. Extrinsic apoptopic pathway: The caspase cascade is also activated by extracellular ligands, via cell surface Death Receptors. This is done by the formation of a multiprotein Death Inducing Signalling Complex (DISC) that recruits and activates a pro-caspase. For example, the Fas Ligand binds the FasR receptor at the receptor's extracellular surface; this activates the death domains at the cytoplasmic tail of the receptor. The adaptor protein FADD will recruit (by a Death domain-Death domain interaction) pro-Caspase 8 via the DED domain. This FasR, FADD and pro-Caspase 8 form the Death Inducing Signalling Complex (DISC) where Caspase-8 is activated. This could lead to either downstream activation of the intrinsic pathway by inducing mitochondrial stress, or direct activation of Executioner Caspases (Caspase 3, Caspase 6 and Caspase 7) to degrade cellular components as shown in the adjacent diagram. Pyroptosis is a form of programmed cell death that inherently induces an immune response. It is morphologically distinct from other types of cell death – cells swell up, rupture and release pro-inflammatory cellular contents. This is done in response to a range of stimuli including microbial infections as well as heart attacks (myocardial infarctions). Caspase-1, Caspase-4 and Caspase-5 in humans, and Caspase-1 and Caspase-11 in mice play important roles in inducing cell death by pyroptosis. This limits the life and proliferation time of intracellular and extracellular pathogens. Caspase-1 activation is mediated by a repertoire of proteins, allowing detection of a range of pathogenic ligands. Some mediators of Caspase-1 activation are: NOD-like Leucine Rich Repeats (NLRs), AIM2-Like Receptors (ALRs), Pyrin and IFI16. These caspases have the ability to induce direct pyroptosis when lipopolysaccharide (LPS) molecules (found in the cell wall of gram negative bacteria) are found in the cytoplasm of the host cell. For example, Caspase 4 acts as a receptor and is proteolytically activated, without the need of an inflammasome complex or Caspase-1 activation. Caspase-1 is key in activating pro-inflammatory cytokines; these act as signals to immune cells and make the environment favourable for immune cell recruitment to the site of damage. Caspase-1 therefore plays a fundamental role in the innate immune system. The enzyme is responsible for processing cytokines such as pro-ILβ and pro-IL18, as well as secreting them. Researchers decided upon the nomenclature of the caspase in 1996. In many instances, a particular caspase had been identified simultaneously by more than one laboratory; each would then give the protein a different name. For example, caspase 3 was variously known as CPP32, apopain and Yama. Caspases, therefore, were numbered in the order in which they were identified. ICE was, therefore, renamed as caspase 1. ICE was the first mammalian caspase to be characterised because of its similarity to the nematode death gene ced-3, but it appears that the principal role of this enzyme is to mediate inflammation rather than cell death. In animals apoptosis is induced by caspases and in fungi and plants, apoptosis is induced by arginine and lysine-specific caspase like proteases called metacaspases. Homology searches revealed a close homology between caspases and the caspase-like proteins of Reticulomyxa (a unicellular organism). The phylogenetic study indicates that divergence of caspase and metacaspase sequences occurred before the divergence of eukaryotes. ^ a b Functional CASP12 is only expressed in some individuals of African descent, while individuals of Asian or Caucasian descent express only a non-functional truncated form. ^ a b c CASP4 and CASP5 are considered to be the human orthologues of CASP11, which was found in mice and rats but not in humans. ^ Wilson KP, Black JA, Thomson JA, et al. (July 1994). 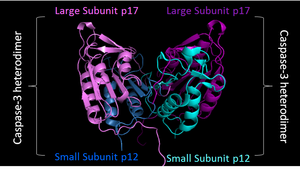 "Structure and mechanism of interleukin-1 beta converting enzyme". Nature. 370 (6487): 270–5. doi:10.1038/370270a0. PMID 8035875. ^ Saleh, Maya; Vaillancourt, John P; Graham, Rona K; Huyck, Matthew; Srinivasula, Srinivasa M; Alnemri, Emad S; Steinberg, Martin H; Nolan, Vikki; Baldwin, Clinton T; Hotchkiss, Richard S; Buchman, Timothy G; Zehnbauer, Barbara A; Hayden, Michael R; Farrer, Lindsay A; Roy, Sophie; Nicholson, Donald W (2004). "Differential modulation of endotoxin responsiveness by human caspase-12 polymorphisms". Nature. 429 (6987): 75–9. doi:10.1038/nature02451. PMID 15129283. ^ Rathore, S.; Datta, G.; Kaur, I.; Malhotra, P.; Mohmmed, A. (2015-07-02). "Disruption of cellular homeostasis induces organelle stress and triggers apoptosis like cell-death pathways in malaria parasite". Cell Death & Disease. 6 (7): e1803. doi:10.1038/cddis.2015.142. PMC 4650714. PMID 26136076. ^ Shalini, S.; Dorstyn, L.; Dawar, S.; Kumar, S. (2015-04-01). "Old, new and emerging functions of caspases". Cell Death & Differentiation. 22 (4): 526–539. doi:10.1038/cdd.2014.216. ISSN 1350-9047. PMC 4356345. PMID 25526085. ^ a b c Goodsell, David S. (2000-10-01). "The Molecular Perspective: Caspases". The Oncologist. 5 (5): 435–436. doi:10.1634/theoncologist.5-5-435. ISSN 1083-7159. PMID 11040280. ^ McIlwain, David R.; Berger, Thorsten; Mak, Tak W. (2013-04-01). "Caspase Functions in Cell Death and Disease". Cold Spring Harbor Perspectives in Biology. 5 (4): a008656. doi:10.1101/cshperspect.a008656. ISSN 1943-0264. PMC 3683896. PMID 23545416. ^ a b Galluzzi, Lorenzo; López-Soto, Alejandro; Kumar, Sharad; Kroemer, Guido (2016-02-16). "Caspases Connect Cell-Death Signaling to Organismal Homeostasis". Immunity. 44 (2): 221–231. doi:10.1016/j.immuni.2016.01.020. ISSN 1074-7613. PMID 26885855. ^ Jänicke, Reiner U.; Sohn, Dennis; Totzke, Gudrun; Schulze-Osthoff, Klaus (June 2006). "Caspase-10 in Mouse or Not?". Science. 312 (5782): 1874. doi:10.1126/science.312.5782.1874a. PMID 16809511. ^ Stowe, Irma; Lee, Bettina; Kayagaki, Nobuhiko (2015). "Caspase-11: arming the guards against bacterial infection". Immunological Reviews. 265 (1): 75–84. doi:10.1111/imr.12292. PMID 25879285. ^ Koenig, Ulrich; Eckhart, Leopold; Tschachler, Erwin (2001). "Evidence That Caspase-13 Is Not a Human but a Bovine Gene". Biochemical and Biophysical Research Communications. 285 (5): 1150–4. doi:10.1006/bbrc.2001.5315. PMID 11478774. ^ Denecker, Geertrui; Ovaere, Petra; Vandenabeele, Peter; Declercq, Wim (2008-02-11). "Caspase-14 reveals its secrets". The Journal of Cell Biology. 180 (3): 451–458. doi:10.1083/jcb.200709098. hdl:1854/LU-394311. ISSN 0021-9525. PMC 2234247. PMID 18250198. ^ a b Shi, Yigong (2004-06-25). "Caspase Activation". Cell. 117 (7): 855–858. doi:10.1016/j.cell.2004.06.007. ISSN 0092-8674. PMID 15210107. ^ Lahm, Armin; Paradisi, Andrea; Green, Douglas R; Melino, Gerry (2003). "Death fold domain interaction in apoptosis". Cell Death and Differentiation. 10 (1): 10–2. doi:10.1038/sj.cdd.4401203. PMID 12655289. ^ Kumar, S (2006). "Caspase function in programmed cell death". Cell Death and Differentiation. 14 (1): 32–43. doi:10.1038/sj.cdd.4402060. PMID 17082813. ^ Riedl, Stefan J.; Shi, Yigong (Nov 2004). "Molecular mechanisms of caspase regulation during apoptosis". Nature Reviews Molecular Cell Biology. 5 (11): 897–907. doi:10.1038/nrm1496. PMID 15520809. ^ Lavrik, I.; Krueger, A.; Schmitz, I.; Baumann, S.; Weyd, H.; Krammer, P. H.; Kirchhoff, S. (2003-01-01). 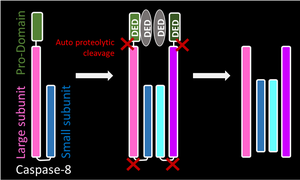 "The active caspase-8 heterotetramer is formed at the CD95 DISC". Cell Death & Differentiation. 10 (1): 144–145. doi:10.1038/sj.cdd.4401156. ISSN 1350-9047. PMID 12655304. ^ Elmore, Susan (2007-06-01). 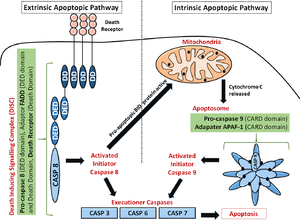 "Apoptosis: A Review of Programmed Cell Death". Toxicologic Pathology. 35 (4): 495–516. doi:10.1080/01926230701320337. ISSN 0192-6233. PMC 2117903. PMID 17562483. ^ a b c Sollberger, Gabriel; Strittmatter, Gerhard E.; Garstkiewicz, Martha; Sand, Jennifer; Beer, Hans-Dietmar (2014-02-01). "Caspase-1: The inflammasome and beyond". Innate Immunity. 20 (2): 115–125. doi:10.1177/1753425913484374. ISSN 1753-4259. PMID 23676582. ^ Creagh, Emma M. (December 2014). "Caspase crosstalk: integration of apoptotic and innate immune signalling pathways". Trends in Immunology. 35 (12): 631–640. doi:10.1016/j.it.2014.10.004. PMID 25457353. ^ Bergsbaken, Tessa; Fink, Susan L.; Cookson, Brad T. (2009). "Pyroptosis: host cell death and inflammation". Nature Reviews Microbiology. 7 (2): 99–109. doi:10.1038/nrmicro2070. PMC 2910423. PMID 19148178. ^ a b c d e f Eldridge, Matthew JG; Shenoy, Avinash R (2015). "Antimicrobial inflammasomes: unified signalling against diverse bacterial pathogens". Current Opinion in Microbiology. 23: 32–41. doi:10.1016/j.mib.2014.10.008. PMID 25461570. ^ He, Wan-ting; Wan, Haoqiang; Hu, Lichen; Chen, Pengda; Wang, Xin; Huang, Zhe; Yang, Zhang-Hua; Zhong, Chuan-Qi; Han, Jiahuai (2015-12-01). "Gasdermin D is an executor of pyroptosis and required for interleukin-1β secretion". Cell Research. 25 (12): 1285–1298. doi:10.1038/cr.2015.139. ISSN 1001-0602. PMC 4670995. PMID 26611636. ^ Yuan, J; et al. (1993). "The C. elegans cell death gene ced-3 encodes a protein similar to mammalian interleukin-1 beta-converting enzyme". Cell. 75 (4): 641–652. doi:10.1016/0092-8674(93)90485-9. PMID 8242740. ^ Alnemri ES, Emad S; et al. (1996). "Human ICE/CED-3 Protease Nomenclature". Cell. 87 (2): 171. doi:10.1016/S0092-8674(00)81334-3. PMID 8861900. Archived from the original on 17 December 2012. Retrieved 6 March 2011. ^ Klim, Joanna; Gładki, Arkadiusz; Kucharczyk, Roza; Zielenkiewicz, Urszula; Kaczanowski, Szymon (2018-04-27). "Ancestral State Reconstruction of the Apoptosis Machinery in the Common Ancestor of Eukaryotes". G3: Genes, Genomes, Genetics. 8 (6): 2121–2134. doi:10.1534/g3.118.200295. ISSN 2160-1836. PMC 5982838. PMID 29703784.